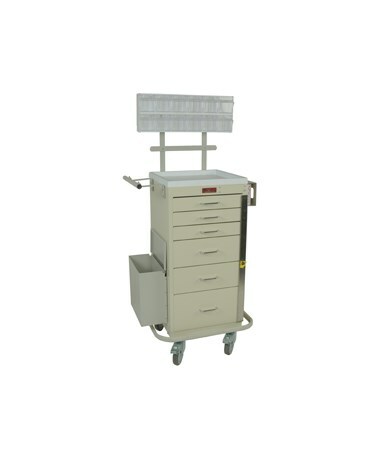 The Harloff Mini Line Six Drawer Phlebotomy Cart is a medical storage device designed with an ample storage and is a great choice for any phlebotomy lab. 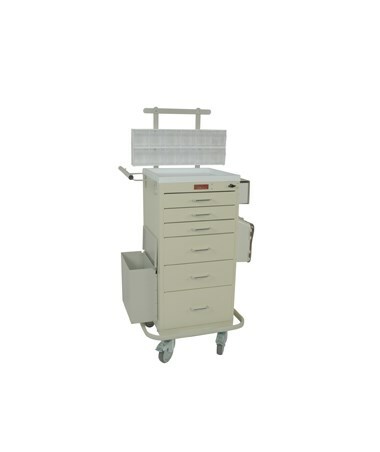 The cart adds an impressive range of functionality and durability to the phlebotomy field. Sturdy and Functional. 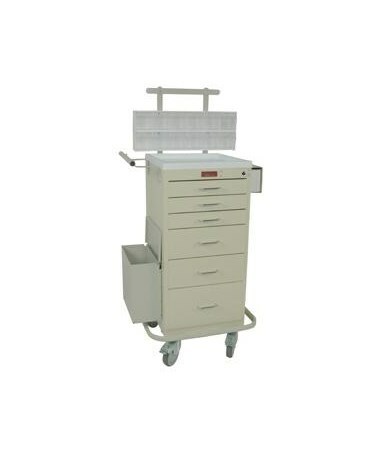 With an all-steel and latex-free construction, the Mini Line Six Drawer Phlebotomy Cart has a hard-baked powder coated finish in various available colors. 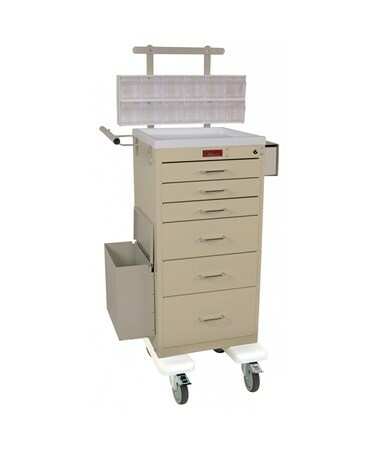 The cart features six steel drawers that are mounted on ball-bearing, full extension slides and has a vertical space of 30-inches. A removable plastic top provides a convenient workspace and a 2-tier raised back rail system holds two 6-bin tilt bin organizers that add even further functionality to the cart. It also includes pre-threaded accessory mounting holes, a single glove box holder, and an aluminum waste container. Safe and Easy Transport. 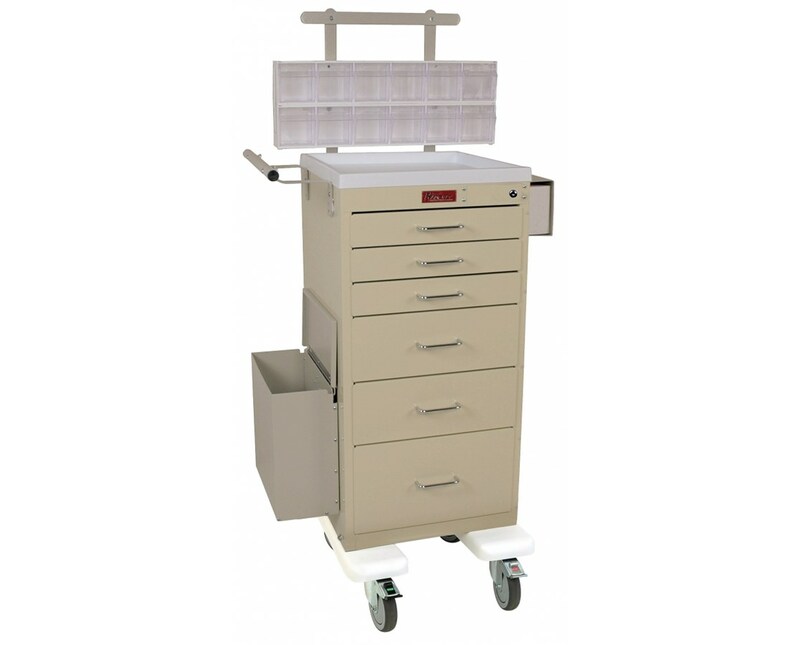 Mounted on 5" premium plate casters, the Mini Line Six Drawer Phlebotomy Cart, with the extended push handle, can be moved around the facility hassle-free. The base of the cart features a wrap-around, stabilizing bumper for added security and improved stability especially during movement. Number and Size of Drawers (3) 3", (2) 6", (1) 9"